Flashback is designed to mock HTTP & HTTPS resources, like web services and REST APIs, for testing. How Dropbox rolled out same-site cookie based defenses, and some guidelines on how you can do the same. GraphQL is a new way to consume and build APIs, enabling tight integrations not possible with REST APIs. Here’s an exploration of GraphQL via GitHub’s GraphQL API. 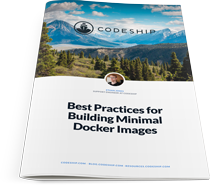 In this free eBook, we will look at some ways to streamline your Docker image as small as possible, using code examples to highlight different strategies. Automated Certificate Management (ACM) handles all aspects of SSL/TLS certificates for custom domains. The only catch is it’s for apps on paid dynos only. The first in a three part series digging into how Apache works, the key performance metrics that you should monitor, and how. What are some symptoms coming from a monolithic app that could indicate microservices may be in order? Includes a new worker_shutdown_timeout directive for a timeout to be used when gracefully shutting down worker processes. ..with Kubernetes to fuel highly secure and rapid development of cognitive apps. Zapier is a service that makes it easy to automate tasks between webapps. A simple way to write and test Docker images: validating the official Nginx Docker image using Goss in ~0.5s. See how Rollbar goes deeper than New Relic to give you greater coverage and insights into your errors. Get x-ray vision into broken code. This tool’s goal is to promote Netlify but it does share some useful load time numbers.